The following discussion addresses creation of two W. M. Keck Observatory Laser Guide Star images which illustrate the April 2008 Smithsonian Magazine “Homing in on Black Holes” article by Robert Irion. These techniques and concepts are also applicable to the more general subject of my approach to photographic documentation of Adaptive Optics / Laser Guide Star systems at both Keck and Lick Observatories.This post was first written in 2008, in response to reader’s questions about these photographs. The text has been updated several times in the interim, and a 2015 photo added (See Claire Max Laser Portrait below). Photographs shown below can be viewed in larger format in my Keck Observatory and Lick Observatory Portfolios, including camera settings, image information, and (on some images) contributions by astronomers describing their observing programs on the nights the photos were made. Click "i" for Information in the navigation bar on the bottom of each image page. My 2007 photo expeditions to Hawai‘i were sponsored by University of California Observatories and W. M. Keck Observatory. Laser photographs were made possible by the hospitable WMKO staff who collaborated on the project in the most fundamental and substantial ways. I also thank OMKM (Office of Maunakea Management), Maunakea Support Services (MKSS), and the ever-helpful VIS (Visitor Information Station) Rangers who kept me safe and productive on the summit. My assistant and I wish to recognize and acknowledge the very significant cultural role and reverence that the summit of Maunakea has always had within the indigenous Hawaiian community. We are most fortunate to have had the opportunity to photograph on this mountain. UCO Adaptive Optics / Laser Guide Star technology was pioneered at Lick Observatory on the Shane 3-meter Telescope. The 3-m was the first telescope in the world to yield AO/LGS science results. I am deeply indebted to UCO and to Mount Hamilton staff, neighbors, and friends with whom I have closely worked to produce laser photographs. My warmest appreciation is extended to the AO/LGS specialists for their dedicated contributions to my ongoing LGS photographic projects, and for their continuing patience with my experimental efforts. Comments regarding the Keck II laser in the following essay refer to its 2007 side launch laser, and may not necessarily apply to the newer center launch Laser. The cover photo is similar to, but different from the view witnessed by the photographer on Maunakea a year before “Homing in on Black Holes” was published. No human could have seen exactly this image with his or her own eyes. Yet it is neither a photo illustration nor a photo composite. It is a single fifteen-minute exposure of the Keck II Adaptive Optics Laser as recorded with a digital camera. For that reason the laser appears far more saturated than the “dim amber pencil beam” that author Rob Irion accurately describes in the article. The cover photograph was made on April 5, 2007, three months before Dr. Andrea Ghez was in Hawai‘i for her Keck observing run. (Ghez and her research are the subject of the “Black Holes” story.) The April 5 observers were studying quasars, with the Keck II telescope and laser pointed high in the sky in a northerly direction. Had the photograph been made when Dr. Ghez was at the helm in July 2007, the telescope would most likely have been pointed toward the south and somewhat closer to the horizon at the primary region of her research: the area surrounding the black hole at our galactic center in Sagittarius. Close inspection of the cover photo reveals a laser beam subtly spread by its tracking motion. If pointed further from the meridian or celestial pole, the beam would probably have appeared in a fifteen-minute digital exposure as an elongated, rust-colored fan — a record of the laser’s more pronounced arc across the sky as the telescope tracked the invisible source. The laser is exceptionally bright and narrow in the cover photograph for several reasons. Telescope and laser are pointed high in the north, relatively close to the axis of earth's rotation. (Apparent motion of stars is substantially less near the poles than in other parts of the sky. That is why Polaris, or the “North Star”, hardly appears to move throughout a northern hemisphere night.) The slow-moving laser delivered a swath of photons to the camera CCD which resulted in a highly saturated and concentrated image. If one is looking perpendicular to the tiny section of cone defined by the tracking laser during the exposure period, one will see the actual extent of the arc. If, as is the case here, the laser is tracking nearly tangentially to the line of sight, one will see the minimum apparent spread of the laser’s arc, thus enhancing apparent brightness in the photograph. A wide disparity in laser beam luminosity can be seen and photographed on the same night. Sometimes the shaft is barely visible to the eye, even when one is very close to the domes or inside; other times it is surprisingly vibrant somewhat farther away. Visibility is in large part a function of varying density of atmospheric particulates which reflect and scatter laser light. Without particulates (as in space, for example), the laser would be invisible both to us and to the camera. Other factors affecting apparent laser brightness include lunar phase and sky position (translating to sky brightness), telescope position and tracking, and camera position relative to laser direction and sky background. It should be noted that, barring technical difficulties, power of the propagating laser remains constant at around 12 watts. Its varying appearance to the eye and camera is usually dependent on external factors. For example, sometimes the atmosphere above Lick Observatory's 4,200-foot Mount Hamilton summit is smoky from nearby wildfires. If the particulate count is not too high, it is still possible to use the telescope. On such a night, the laser is atypically bright from several hundred yards away. However, most visitors to Mt. Hamilton don't even see the laser when it is propagating, unless they are close to the dome. On Maunakea, I was initially surprised to find that the Keck II laser was much less visible than what I was accustomed to seeing at Lick, even though both lasers propagate at approximately 12 watts. However, It seems reasonable to expect that the atmosphere is cleaner on the summit of 14,000-foot Maunakea than on the rim of Silicon Valley. I was sometimes unable to see the laser in the dome -- I could only rely on the knowledge that it was propagating, and that the more sensitive camera CCD would record it. My hope was that the composition of the frame would include as much of the beam as possible, but it was a guess. It should be noted that considerable calculation was necessary to schedule and capture this image so that the Moon (at 88% disc illumination) would be just high enough to subtly illuminate landscape and domes, but not so high that it might overly brighten sky and domes, diminish saturation and abundance of star trails, and decrease contrast between sky and laser. There was also the formidable difficulty of producing extended, vibration-free exposures in fierce gusting winds on the cold Maunakea summit, under extremely demanding physical conditions. Although the Moon had just crested the summit behind the camera when this photograph was made, the overhead sky was still fairly dark with good contrast. In a photograph, the laser is usually more discernible against a dark sky, although that is not always the case, and additional factors can fluctuate from night to night. In a three-minute exposure made two nights earlier on April 3, 2007 (image below), the Keck II laser appears in a close-up exterior view as an elongated fan shape. The "fan" reveals and records the path of the laser sweeping across the sky as the moving telescope tracks a target high in the south. The dome's rotation to maintain an open shutter alignment with the telescope is recorded as a blur in the moderately long exposure. “North Sky” in the image name refers to the background north polar region, including Polaris which is centrally located in the photograph. One might also ask: were there more or less particulates in the rarefied air on April 3 than on April 5? Image LH0890 (below) is a ten-minute exposure made on April 2, 2007; camera positions for this and the cover image were very close to each other. A 100% full Moon illuminated this landscape and sky. Camera and lens were the same as those used for LH0991, but exposure length and lens aperture were not. Note shadows of three camera tripods at lower right. (Piles of sandbags securing each of nine tripod legs from buffeting winds are not visible!) If it is hard to imagine that the laser, domes, sky, and land could look so different from night to night, I couldn't agree more. That is why I keep shooting; it is never the same way twice. An additional variable should also be considered: at the 13,083-foot / 4207-meter Maunakea altitude, atmospheric oxygen levels are about 60% that of sea level. Because oxygen deprivation adversely affects vision sensitivity, the laser might not seem as intense or colorful to people on the summit. Breathing bottled oxygen helps, but the faithful camera remains immune to this deficiency! This photograph inside the Keck II dome was shot on April 3, 2007, with the telescope aimed at the zenith for laser calibration. The view is from the “bogie deck”, between the Nasmyth deck above and the floor level below. We rushed to that location when Observing Assistant (OA) Joel Aycock thoughtfully alerted our WMKO liaison and chaperone Laura Kinoshita that the telescope would be returning to zenith for a short time. During the calibration, the telescope was not tracking, which allowed an exposure time of five minutes. There does appear to be a slight motion blur in the telescope which is not duplicated in the dome — perhaps telescope motion occurred either at the beginning or end of the exposure. It would probably have been the latter as I often leave the camera shutter open to maximize exposure duration until I hear or see a change in telescope, laser, or dome. I have only been inside the Keck II dome photographing for a few cumulative hours during laser propagation. But at the Lick Observatory 3-meter laser, virtually any interior camera exposure longer than 1 minute with the telescope tracking will show visible motion blur, even if the target object is close to the polar axis. When I’m inside the dome and close to the laser I love seeing its ephemeral three-dimensional transparency superimposed on the sky. It is subtle yet breathtaking, but the camera is very poor at showing it. In photographs, the laser appears to be solid, more saturated, and somewhat flat. One of the few indications that it is not is when the occasional intersected star trail peeks through the amber beacon. Sky color when the moon is bright can become an intense blue over longer exposures both inside and outside the dome, more so than the eye usually detects — although sometimes I am astounded by how richly-colored a moonlit night sky can be when my eyes are fully dark adapted. Anyone with reasonably good image processing skills can potentially “fake” an image by surreptitiously incorporating elements from other photographs shot at different times and / or places, then falsely representing it as “real” or “as it was in the moment”. Aside from fundamental ethical questions, I do not see any challenge in that, nor would I derive satisfaction from it. Of far greater intrinsic reward is mastering the skills to precisely calculate and execute a difficult and unusual photograph, or paying attention to the nuances of nature and being ready to snap the frame when the moment presents itself. Sometimes this is spontaneous, but more often than not it requires tremendous investment in equipment, calculation, and execution. And there are so many failures! Even so, this is infinitely more satisfying for me as a photographer. It is also more meaningful to those viewers who appreciate the pictures and value photographic integrity. In the years I have been producing documentary photographs for a scientific institution (University of California Observatories), it has been important to me and to my community that images be “real”, and not “faked” insofar as an image is accurately represented. Although the Smithsonian Magazine images LH0906 and LH0991 were captured in single exposures, I occasionally produce composite images for a variety of reasons: To illustrate a concept, to improve understanding, to blend unavoidable extremes in exposure values, to correct known deficiencies or inherent limitations and inaccuracies induced by camera detectors and lenses under various conditions, to combine and blend multiple frames, and/or to utilize and balance all available raw image file data. In addition, I often shoot with fisheye and wide angle lenses, although they sometimes distort architecture and especially people in ways that are peculiar and unwanted. Corrections and retouching are often applied to neutralize these incongruities. This information is disclosed so the viewer is informed of the multi-source or altered image provenance. I expect no less as a viewer myself. An example is a photo-illustration composite of the iodine cell instrumentation used to discover extra-solar planets at Lick Observatory; see image LH2162 below. The pale pink starlight beam is a software-generated illustration, overlaid on the actual photograph of the iodine cell. This information is outlined in the imaged description on my website. The camera doesn’t lie — or does it? Sometimes limitations in image capture media and equipment — film, CCD, lens, etc. — distort accuracy of the image to a degree where I believe adjustment is both necessary and justified to return the image closer to “reality”. For example, some types of film render the laser color as green due to the emulsion’s inability to correctly register the sodium yellow laser color. I believe it would be irresponsible to perpetrate images in which the laser is green instead of sodium yellow, and I know my scientific constituency agrees as I have discussed it with leaders in the field. The CCD in my digital camera much more accurately captures the nuanced saffron shades of the laser, to my relief. (Both magazine images were digital capture.) As previously discussed, the laser usually appears more saturated in the digital image than to the naked eye because of longer integration periods with a sensitive CCD — typically a few seconds to an hour or more, as compared to the eye’s 1/10 second. Also, the color of the translucent laser in photographs is influenced by the night sky, which is typically a very deep blue. Superimposed on the sky, and especially with shorter exposure times, the camera often records the laser as a dark, muted orange rather than the standard saffron hue typically associated with the sodium laser as it appears in a laboratory setting. CCD development for consumer and professional cameras is a fast-moving technology. As sensors with higher signal-to-noise ratios are produced, nighttime exposures using consumer and pro-grade cameras can be shortened (if desired). Eventually, digicams might reproduce what the eye sees in the same integration period, or close to it. This would give the photographer a choice between making a noise-free exposure that more closely resembles what the eye perceives, or a longer integration showing paths of star trails and a saturated laser of which only the camera is capable. At present (2007), I can see more light at night in 1/10 second than my camera can. The reasons for this are fascinating, but beyond the scope of this discussion. Should I as the photographer intentionally manipulate and alter photographs by desaturating and toning down long-exposure laser images to more closely resemble the muted laser beam as it is perceived by the naked eye? If so, what about exposure values in other areas of the image that are different from what the eye can detect? Although the laser extends about 90 kilometers into the atmosphere, its full length cannot be seen. The thin ochre probe seems to disappear into the sky, but in fact extends far beyond. This is due to a variety of reasons that will not be addressed here. (This part of the photograph was cropped on the Smithsonian cover, but it is visible in the master image.) To capture the transition area in the photograph, I needed a lens that would allow the widest possible field of view while retaining sharp detail. In my kit the best choice was a 10.5 mm f/2.8 fisheye. However, I knew in advance that the resulting laser would appear with an unacceptable curvature typical of fisheye lenses, instead of being arrow-straight. Because Laser Guide Star scientists dislike artificially bowed laser beams as much as sickly green ones, a Photoshop filter was applied to restore the inaccurate fisheye distortion to that of a rectilinear view. Additional retouching was needed to accurately restore the laser. I see this not as employing Photoshop “trickery” but rather as selecting the most sensible, high-precision tools available to achieve optimal, authentic results. A similar fisheye perspective correction was applied to image “0890 Keck LGS Landscape” mentioned above. My background is in fine arts and music. It is my privilege to have lived at Lick Observatory, and to continue producing images for the astronomical community. I wear two hats as a photographer — that of an artist, and that of a documentary recorder / technician. Both are of equal importance to me; my work results from a melding of the disciplines. Modern tools and techniques are among the means by which I produce and personalize my craft. I do not use a chemical darkroom, but rather a digital one. Adjustments in image balance, tone, and contrast are made not to “fool the eye” but rather to utilize all available image file data as deemed appropriate. Raw image files or scans can sometimes appear overly flat and washed-out without adjustment to use all legitimate data contained therein. There is a tremendous exposure range in CCD-generated image files, although not as broad in scope as that detected by the human eye in certain conditions. When exposure values of a given scene exceed my camera’s capability (but not my eyes’), I might shoot two back-to-back images of the same subject but with different exposure values (providing the subject is immobile). Those images are then blended together with the best exposure extracted from each to produce a single broad-exposure image, closer to what I saw in the moment. This is a standard technique commonly used in professional imaging to effectively extend dynamic range. Sometimes adjustments are made to overcome inadequacies in media and capture, for example, unwanted extremes in exposure or distracting flaws such as CCD noise and film grain. On the other hand, there can be aesthetic and journalistic legitimacy in preserving the authentic character and artifacts of capture media and process. Ultimately, I try to make the image appear as I remember it, without contrivance or false exaggeration. But of greatest importance is to convey the sheer magnificence and emotion that inspired me to take the picture in the first place. The photograph is a vicarious record of my experience and impressions of the moment, as subjective as those might be. Platitudes can be simplistic, but I often remind myself that there are no mundane subjects — only mundane photographers. This forces me to see the world in new ways. This discussion is not without paradox. Sometimes the camera sees that which the photographer cannot, and sometimes the photographer sees what the camera cannot. In viewing and photographing the laser both statements are true. It is my responsibility and prerogative as the artist / technician / photographer to arbitrate and balance these factors in the final image. 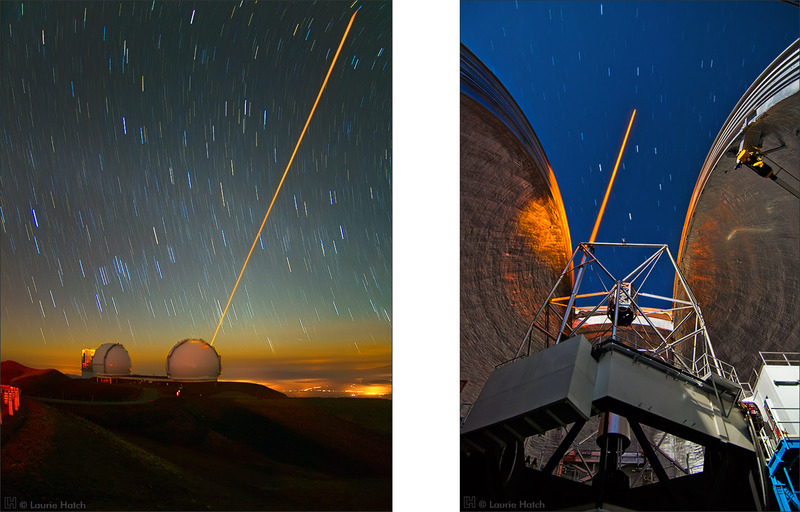 On a number of occasions both at Lick Observatory and on Maunakea, I have set up three or more different cameras to simultaneously photograph the Laser Guide Star system, both digital and film, in varying formats, inside and out — yet the results from each are never the same, and they run the gamut from tragically bad to rare “keepers”. My eyes and the cameras can never see exactly the same landscape; each type of detector has its own unique sensitivities, limitations, flaws, and strengths. Nonetheless, humans remain physiologically constrained to 1/10-second integrations. Although bound by other limitations, the camera typically delivers long-exposure Laser Guide Star images that surpass, but are not necessarily better than human perception. Reproduce only by written permission.